superhero groups. The "gifted youngsters" are mutants with special abilities, and the school's dual purpose is to teach them how to use their powers wisely, and to protect the world from evil mutants and other assorted menaces. The X-Men ("X" stands for "extra abilities") don't get thanked for their good deeds. The general public of the Marvel Universe doesn't distinguish between good and evil mutants — all, no matter how they use their powers, are objects of hatred and fear. Thus, the X-Men function as a metaphor for racial and religious minorities, those persecuted for their sexual preference or other differences, or just the alienation and uncertainties of the teenage years themselves. After that, it was one evil mutant after another — in #4, in fact, Magneto gathered several together as The Brotherhood of Evil Mutants (where Quicksilver and The Scarlet Witch, later members of The Avengers, got their start). Creative personnel came and went; and although some high-power artists (notably Neal Adams, Jim Steranko and Barry Windsor-Smith) drew the series at various times, it attracted little interest from fans. The most notable thing to happen in the 1960s X-Men was the re-introduction, in #10, of Ka-Zar, a Tarzan knock-off who had appeared in 1930s pulp magazines and 1940s comic books. 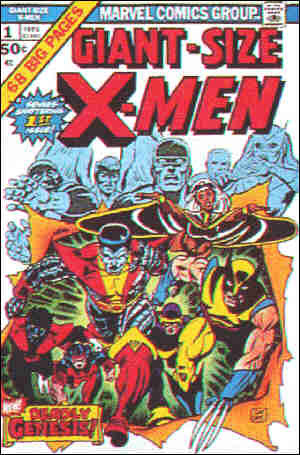 In 1970, with the 66th issue, the adventures of The X-Men ended — after that, the comic was filled with reprints. The group was revived five years later, but with new characters. Most of the old ones graduated from the school and went their separate ways, and their places were taken by an even odder assortment than before — Nightcrawler, whose monster-like appearance made him even more an outcast than most; Wolverine, whose mysterious background made him an instant hit with fans; Storm, an exotic beauty with an affinity for nature; and more. The group became more fluid, with characters added and dropped at an awesome rate until it rivaled The Avengers in number and variety of former members and associates. Multi-part adventures, with exciting cliffhangers, scripted by hotshot young writer Chris Claremont, began to draw fan interest. Before long, X-Men was Marvel's best-selling comic. And it remains so today. Most of its characters have been spun off into one-shots and mini-series of their own. Ancillary groups, too, have been spun off — X-Factor, X-Force, Excalibur, New Mutants, etc. In 1992, it was made into the first of a new wave of Marvel TV animation, airing weekly on the Fox network, and the TV show was adapted into a separate comic book, aimed at younger readers. As popular as X-Men and its many, many spin-offs are today, it's hard to believe that at one time, the series was canceled because the fans weren't interested in it.